LILLY'S SOLUTION TO COLD PUNANI! LILLY Ngwenya has the solution for a cold punani. The 45-year-old woman from Forest Hill, Joburg said she helped women who couldn’t make their men happy in bed. “These problems start at an early age. When girls become young women, there must be a ceremony or ritual to introduce them to adulthood. “If this doesn’t happen, the girls will have problems when they are older,” said Lilly. She said the same thing happened to boys. Dineo Phala (39) from Katlehong, Ekurhuleni said she knew she had a problem but she blamed her man when he left her. “I came to see Lilly who told me my parents didn’t perform a ceremony for me when I entered adulthood. Today, my man is back and we are fine,” said Dineo. 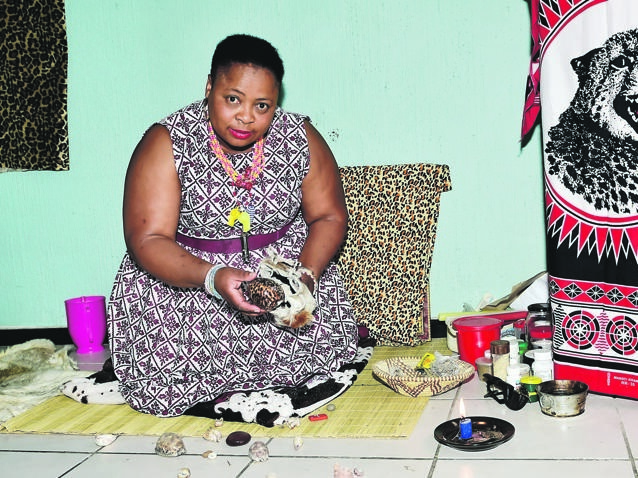 A 26-year-old woman said she didn’t believe in sangomas but her difficulties landed her at Lilly’s door. “She worked her magic on me and I am fine now,” she said. Born in Hammarsdale, KZN, Lilly had a calling to become a sangoma when she was three years old. “I was shown a necklace with a cross that belonged to a mkhulu. I got my powers from him,” said Lilly. She said because of her powers she never struggled at school. “I had a clear understanding of every subject. “I passed my diploma in teaching at Mpumalanga College of Education easily,” said the primary school teacher.